Human activities represent unique selective pressures for natural populations. This is especially true for fish species where we routinely harvest individuals from the wild, i.e., through fishing. It has been recognized for some time that overfishing can result in population crashes. More recently it has become clear that selective harvesting can result in evolutionary changes. For example, by fishing only large individuals there is selection to reach maturity at a younger age and smaller size and to direct more resources towards reproduction. For a review of fisheries induced evolution, see Heino et al., 2015. An interesting (depressing?) phenomenon in fisheries is the lack of recovery of many populations even after the cessation of fishing. Atlantic Cod provide a prime example of this issue. In the Gulf of St. Lawrence, the population initially collapsed in the 1980’s and fishing was largely stopped in 1993. However, the fishery has still not recovered (Swain et al., 2007), perhaps, in part, due to fishery induced evolution. One aspect of evolved responses to harvesting that has been overlooked is gene expression. Phenotypic traits are influenced by gene expression and to understand how complex life history is evolving, it is necessary to study the changes in gene expression that occur. Uusi‐Heikkilä and colleagues use experimental evolution in zebrafish to assess how gene expression evolves in harvested fish populations (link to paper). The authors used a fairly straightforward design to simulate natural fishing conditions. For 4 generations they harvested the largest 75% of individuals to mimic harvest pressure while their controls harvested randomly sized individuals. Following this, they stopped harvest and let the populations continue for 6 more generations. They performed RNAseq on livers pre-selection, post-selection and at “recovery”. Comparing expression profiles following selection, the authors found that the number of differentially expressed genes between the selection lines increased from 3% pre-selection to 24% post selection. This is quite an increase. After recovery, this dropped to 17%, though only 26% of differentially expressed genes were consistent between post-selection and recovery. This surprised me, as I would have expected a slow loss of differential expression rather than the development of a new set of differentially expressed genes. Though, this pattern may represent lab adaptation. It would be interesting to see how a completely non-harvested line adapts to lab conditions to control for this issue. There were also substantial changes in gene expression in the randomly-selected fish by the end of the experiment, suggesting that subsampling individuals can result in evolution of expression profiles. This argues that hatchery fish likely have different expression profiles than wild individuals and may help to explain the commonly observed reduced performance of hatchery fish. Figure 1: Changes in variance of gene expression. (a) from pre- to post-selection. (b) from post-selection to recovery. Figure from Uusi‐Heikkilä et al. 2017. To me, the most interesting results are the effects on variation in gene expression through the experiment. Following selection, all treatments had reduced variance in expression (Fig. 1). This isn’t unexpected as all treatments went through a bottleneck. What is really intriguing is that variance in expression in the selected individuals continued to decrease through recovery while the non-selected populations recovered. 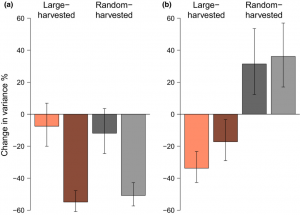 This has important implications for the reduction of adaptive potential in heavily harvested fisheries and could, in part, explain the lack of recovery of many of these species in the wild. Hence, our results reinforce the recommendation of applying evolutionary principles to management and promote management that maintains large and diverse breeding populations to foster the full range of phenotypes and genotypes that natural selection can act upon. Heino, Mikko, Beatriz Díaz Pauli, and Ulf Dieckmann. “Fisheries-induced evolution.” Annual Review of Ecology, Evolution, and Systematics 46 (2015): 461-480. Swain, Douglas P., Alan F. Sinclair, and J. Mark Hanson. “Evolutionary response to size-selective mortality in an exploited fish population.” Proceedings of the Royal Society of London B: Biological Sciences 274.1613 (2007): 1015-1022. Uusi‐Heikkilä, Silva, Tiina Sävilammi, Erica Leder, Robert Arlinghaus, and Craig R. Primmer. “Rapid, broad‐scale gene expression evolution in experimentally harvested fish populations.” Molecular Ecology (2017). This entry was posted in adaptation, conservation, evolution, genomics, transcriptomics and tagged conservation, transcriptomics. Bookmark the permalink.